Peter Hamilton, Head of Strategic Partnerships at Zurich has a close look at millennials. It's a fascinating subject and he considers what we need to do to make protection more accessible to young people. Millennials. What are they like? The millennials, simplistically those born in the 20 years or so after 1980, must be one of the most researched generations of all. Studies have suggested they are socially conscious and socially connected online, but not to organised politics or religion, burdened by debt, largely distrustful, but loyal to certain brands. That said, it's a moving target, and these are always hard to hit, and there’s a separate question as to the value of an age-based rather than attitudinal segmentation of customers. Elsewhere, millennials are simply seen as one of the divisions lined up in the ‘intergenerational’ struggle. The idea has been fermenting for a while, analysed in detail in ‘The Pinch’ by David Willets:’ How the baby boomers took their children’s future and how they can give it back’. Vince Cable has described inter-generational unfairness as ‘the greatest social injustice of the 21st Century’. An Institute of Fiscal Studies report (Stagnation generation: The case for renewing the inter-generational contract) suggested that people born in the early 80s have an average net household wealth of £27k in their thirties, while those born in the 70s had accrued £53k at the same age. 40% of the early 80s generation were owner-occupiers at the age of 30 compared with 55% of every generation since the 40s. The Resolution Foundation reckons the government will transfer £1.2bn from millennials to baby boomers over a short number of years. There are intergenerational challenges we need to address at every level. The Brexit vote surfaced some of these tensions. The widely retweeted ‘That’s the last time I’m giving up my seat on the bus for an old person’ was one of the milder expressions of frustration. What to do about it? In part, we need to recognise we have a problem. It’s not helpful when some in my generation can only see a millennial lifestyle that revolves around cocktail bars and expensive gadgets, and which is perceived as decadent by those who hark back to the struggles of high mortgage interest rates and scrimping to raise a family, or, if you go back far enough, industrious wartime habits of rationing and sharing bathwater. Various papers recently ran the story of the millionaire berating the profligacy of the millennial lifestyle, with its over-dependence on smashed avocado with crumbled feta on five-grain toasted bread. These millennials should wake up and smell the coffee (hand ground, obviously). The modern Labour party, a journalist recently observed, is split between the Leninists and the John Lenonnists – the latter being a younger tribe who often don’t need to "imagine no possessions". Why should the young, the question goes, believe in capitalism when they have no chance of owning any capital - job security, rising wages, home ownership are becoming an alien concept. More and more are renting, although of course, it’s not just property – it’s music and films that streamed rather than bought, car journeys rather than cars that are paid for. We’re starting to see some interesting approaches to addressing some of these inter-generational challenges, but not all will be quick. There’s a recognition that the housing market, with some of its perverse incentives overbuilding and moving needs to change. So too the ‘triple lock’ on pensions (where state pensions rise by 2.5% or wages, or prices, whichever is highest) has further exacerbated generational unfairness. More recently I read of a new care home and a nursery on the same site. The old and young take part in activities including singing, cooking, gardening and story-telling. Co-locating nurseries and care homes is an established practice in other parts of the world such as America and Australia. There are benefits for all – for the young in terms of cognitive development, learning and socialisation, for the old keeping active and reducing loneliness and isolation, and breaking down barriers. Parents and grandparents passed on £5bn in gifts and loans last year and are already the 10th biggest lender in the country – some 300,000 transactions. Various banks are now offering forms of inter-generational mortgages. Car insurers offer discounts for family members. From a more parochial Protection insurance perspective, the challenge is both being clear on the need and then how best to create the right level of engagement. Millenials may not yet (or possibly ever) be in a position to buy their own home, but are likely to be paying rent out of income that also supports a broader lifestyle. Social welfare provides less and less support. They may have an employer providing some kind of income protection, but many won't. Some will have families of their own to protect. So for many, there will be a protection need, though disposable income needs to be understood and managed. Pretty obviously, engagement and fulfilment need to have a strong social and mobile core. Research will frequently be done via blogs rather than papers or magazines. There are still plenty of financial websites out there that are not optimised for mobile traffic. We need to learn from the simplicity of apps they value in other parts of their lives – apps which don’t require huge effort to engage with and which provide clear and easily achieved value. 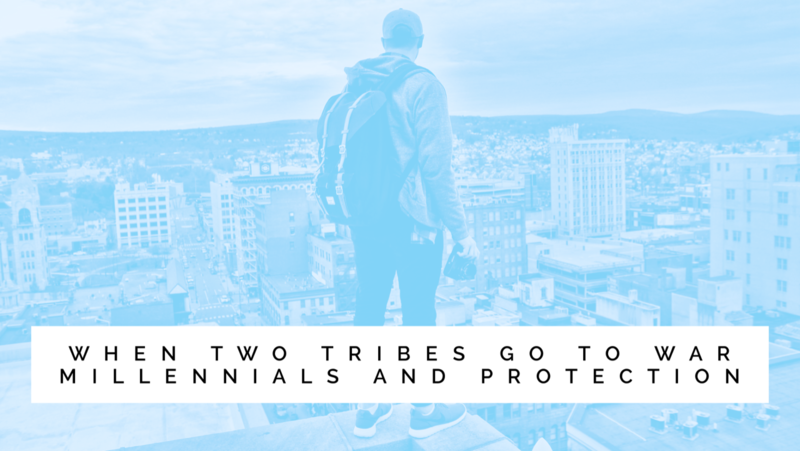 Millennial generate vast amounts of data about themselves, which if used appropriately and with relevant permissions, could be harnessed to craft personalised products, processes and communications. Tone and authenticity will be important and maybe we need to find a way to inject the kind of humour into our connections that is responsible for much of the social sharing done by millennials. More importantly, though, we need to understand attitudinal differences and how far these genuinely differ from other generations. Looking at products, we need to question things like the length of the term we have. Our policies typically extend for 25 years or more, when a new generation of customers will have a financial horizon which may not extend too far beyond the next credit card bill. There are reasons we have long-term policies – not least certainty of cost and availability of cover, but presentationally we have a mismatch. Plans need to cope with periods out of work – sabbaticals and retraining and education, recognise the family unit in a way that many savings platforms do, promote a healthy and longer life. While the baby boomers focus government attention on retirement and healthcare, the young will legitimately want a focus on lifetime education and skills development, flexible working and transitions between different types of employment. One important step along the way is to ensure our own industry is one where different generations want to work, where they feel valued and can make a difference. The more our workforce can reflect the diverse makeup and interests of our communities and customers, the better.